Fast food workers around the world are rising, and showed their determination to fight for rights and recognition on October 4, the IUF's International Fast Food Workers' Day. Across the globe, workers and unions held strikes and rallies and demonstrated their mutual solidarity and support in the struggle for decent pay and conditions and union recognition. In the U.S., on October 4, fast food workers in Chicago went on strike and rallied outside the McDonald's headquarters, where some 50 protestors were arrested. In Milwaukee, workers also walked off the job, shutting down a McDonald's outlet during the rush lunch. Their actions followed walkouts by McDonald's workers two days earlier in Flint and Detroit, where demonstrators were also arrested. 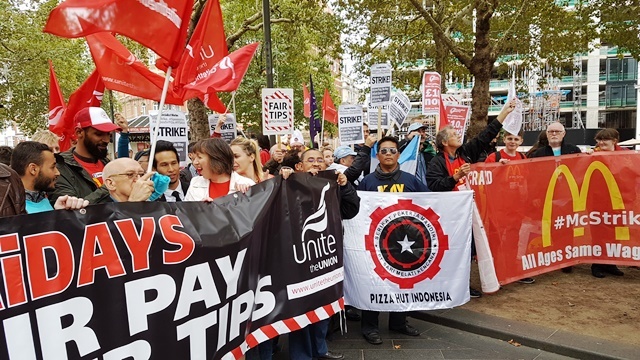 In the UK, workers at McDonald's and TGI Fridays restaurants and Wetherspoon pubs took industrial action and held rallies, and were joined by striking Uber Eats and Deliveroo couriers. Labour Party Shadow Chancellor John McDonnell joined the union picket line and rally in London's Leicester Square. In the Asia/Pacific region, IUF affiliates in Hong Kong, Indonesia and the Philippines, among others, showed their support for the global fight for fast food workers' rights, while trade unionists and Burger King workers in Spain demonstrated against the recent dismissals of union members and activists. On October 3 and 4, IUF member unions representing fast food workers in Argentina, Barbados, Belgium, Brazil, Canada and the USA, Colombia, France, Germany, Indonesia, Italy, New Zealand (by skype), Spain, Thailand and the IUF's Scandinavian affiliates organized in the Nordic HRCT Union came together in an international fast food union meeting convened by the IUF in London to share experience and strategy. 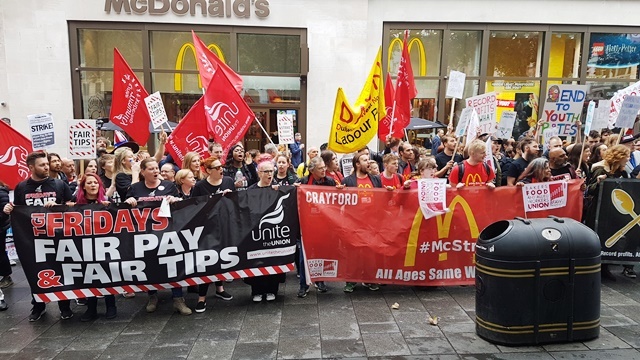 Participants joined the London rallies, expressed their support for the growing number of strikes at Marriott hotels in cities across the US and affirmed their opposition to the ILO's proposed 'partnership' with McDonald's through the Global Initiative on Decent Jobs for Youth.